I am going to get on my "Library Lady Rants" soapbox to say that Hanukah is not, not, NOT a pseud-Christmas, but a minor holiday that is mostly a family celebration. The "tradition" of eight presents was invented somewhere in the last century by Jewish families not wanting to cave in and celebrate Christmas in a secular fashion, or to tell their kids, "sorry,kids, you're Jewish--you don't get presents in December". My own mother comes from a family of radical Jews who celebrated Christmas as a secular holiday and my father went right along with it (as he always does for my mom),so my brother and I had Santa Claus, presents and a tree. As it turns out we both married gentiles and HIS kids are so WASPy they barely know they're half Jewish. I grew up in a Jewish neighborhood in NYC and back then it was okay to sing Christmas/Hanukah songs in schools. And I grew to hate the "Dreidel" song with its endless "dreidel, dreidel,dreidel". So nothing could have startled me more than receiving this book at the library and LOVING it. It uses the song beautifully to show a family celebrating Hanukah. The book sings like a dream--the verses are smooth and fit the tune perfectly. And there's nothing here about presents, BTW! My one quibble is the carrot in the latke recipe--my Grandma Esther would have thought that was nuts and so do I.
I have been known to sing "Chanukkah, O, Chanukkah" at programs, both in English and what my daughter SC called "Spanish" when she was tiny. She loved this song and when she was 2 I sang it to her at night for months--that and "Santa Claus Is Coming To Town". Actually, it's Yiddish and my father, who grew up in a Yiddish speaking home says my accent is pretty good. This is the great performer Theodore Bikel, singing the song in Yiddish, English and then Hebrew. I like to show kids real dreidels and let them try to spin them. It's challenging for preschoolers to do. And then we pretend to be dreidels by playing this game, from an out of print book called "Hanukkah Oh, Hanukkah: A Treasury of Stories, Songs and Games to Share"
Spin little dreidels, now go SLOW! Turn around SLOW-LY! Jump, little dreidels, jump so high Jump up and down! The kids love this game and we play it at least twice--sometimes more. I hope you have fun with all things Chanuka. By the way, have you noticed that I have spelled it at least 3 different ways in this post? That's because they're really is no one way of spelling a Yiddish word in our alphabet. Just say HA-NOO-KAH and try to sort of spit as you're pronouncing the first syllable and you'll have it. And you could spell dreidel as "draidyl" "dreidle" or any other way that sounds like "DRAY-DLE"
Just rhyme it with "ladle" and you're in business. Happy Hanukkah. Sorry I can't invite you all here for cheesecake, but if you pass a library in Northern Virginia next Monday and it smells like cooking oil that's me, frying latkes for the entire staff! This entire post is so informative for a Catholic girl like me. ;-)I think there is a definite misconception about Hanukkah - I know I was told, quite seriously, by a co-worker that the different spellings actually indicated different holidays, and that Hanukkah came first, and then Chanukah. I knew that wasn't right, but couldn't convince her. I also didn't realize that the eight presents tradition is fairly new in the grand scheme of things. 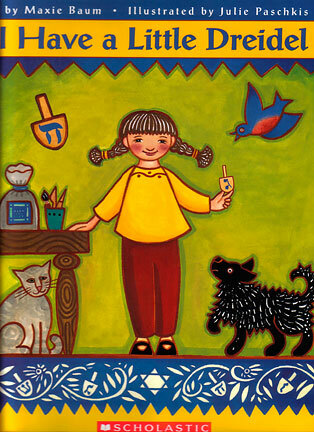 The Hanukkah portion of my story time will focus mainly on the menorah, since that works nicely with counting, but I think the Hanukkah book I chose does mention presents. Interesting. Anyway, this is a very long-winded way of saying thank you so much for this excellent Hanukkah rhyme. It's exactly what was missing from my repertoire! Ask my 90 year old father (raised religiously Jewish) what he got for Hanukah and he'll tell you: "Nothing!" I suspect it began as kids were exposed more and more to Christmas shows on TV. So probably by the 80s it was a "tradition". I still think it's hooey though!